What’s going on? The researchers and experts quoted by various news outlets said there may be a glimmer of good news in the otherwise glum data: Young people and the grown-ups who care about them may be getting youths with suicidal thoughts or behaviors help more readily than before, leading to the uptick in reported cases. 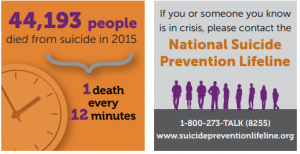 Suicide, just to be clear, is increasing among Americans of all ages, and the nation clearly needs significant increases in its accessible, affordable mental health services. But it’s also true that too many kids, especially, are too stressed out, anxious, and depressed. Anxiety is a rising issue for the young, and depression has become a sufficiently big concern that pediatricians have pushed for universal screening for it. Experts say today’s youth may be under excessive pressure, especially in too many households where young people are pushed to excel in extracurricular activities (sports, music, dance, and the like) or in academics so they can get into elite colleges and universities. There’s also a contemporary factor that worsens young people’s views of themselves and the world, adding to their stresses and strain: Electronic devices, text messaging, and social media, whether in words (e.g. Facebook and Twitter) or images (e.g. Snapchat and Instagram). These modern media can cause the young to confront near 24/7 peer pressure, unfair judgments, and outright, destructive bullying. In my practice, I see the major harms that patients suffer while seeking medical services and the awful injuries that can be inflicted on babies, children, and the young. Grown-ups can offer key perspective and wise counsel to young people but they can be difficult audiences, as they stretch and rebel as part of the natural processes to discover themselves. It’s great to create openings with teens, by listening more and maybe advising less, or gently, if possible. Still, young folks are among our most precious resources, and, if necessary, we shouldn’t hesitate to step in to help them stay healthy and well, including by putting them on restricted use of electronics and social media ─ a major and sensible step, of course, while they’re learning to drive. We have a huge distance to go, too, to ensure girls and young women not only get launched well but that the world offers them a great and fair shake throughout their lives. It’s unacceptable that societal biases put them in such bad stead that too many of them harm themselves, through substance abuse, depression, anxiety, “cutting” and other self-injury, including thoughts of and attempts at suicide. With federal officials also reporting that younger women, those in their 20s and 30s, are delaying pregnancy and delivering fewer babies than in many recent times as they struggle to juggle careers and personal lives, Americans may be getting a signal, loud and clear, as to just how major the changes we need to make will be.